Besides vegetable farms or perhaps at most vegetable farms, there are strawberry farms as well. At most of the strawberry farms, visitors are allow to pluck their own strawberries but of course, there is a price to pay! It's just an experience anyway! 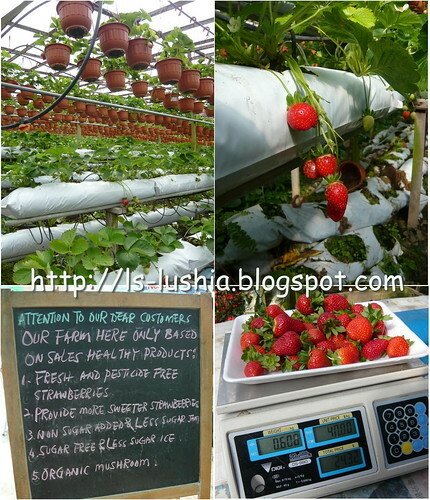 Our first visit was Raju's Hill strawberry farm and surprisingly there are no more strawberries left!! 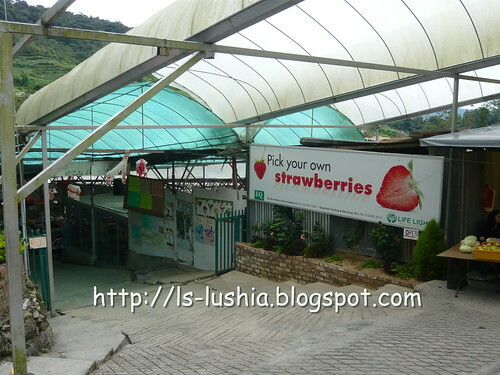 We then stroll down across the road and spotted EQ Strawberry farm and here comes my berries experience! RM 24.00 for not so sweet and yet sourish strawberries. I do enjoy going around the farm picking my own strawberries but don't really enjoy the strawberries I picked. Strawberries grown in Cameron Highlands are definitely not as sweet as those imported berries. So, don't expect it's gonna be as sweet as those imported strawberries you can find in supermarkets. I have learned that strawberry farmers often have hives of bees to live on the farm to pollinate the strawberries. Perhaps, this is the reason that bee farms are also one of the tourist spot in Cameron Highland?